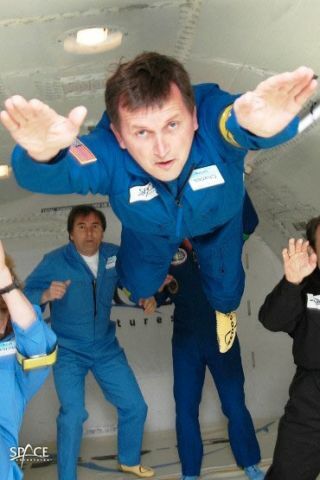 Space tourist Charles Simonyi trains for weightless flight. The first time just wasn't enough, so billionaire CharlesSimonyi is going back to space. The first two-timespace tourist is set to make his second trip to the International SpaceStation next week. He plans to launch March 26 aboard a Russian Soyuz rocketfrom the Baikonur Cosmodrome in Kazakhstan. As part of a $35 milliondeal brokered by U.S. firm Space Adventures, Simonyi is paying the RussianFederal Space Agency to ride along with cosmonaut Gennady Padalka and NASAastronaut Michael Barratt, who are set to become the station's new Expedition19 crew. Simonyi, a former Microsoft software executive, skippedahead of others on the waiting list for trips to space by paying an extra $5million to be part of Space Adventures' Orbital Missions Explorers Circle, an elite clubwith priority access to flights. Simonyi is signed up for a 12-day mission to performresearch on bone density loss and lower-back pain in space, to work onEarth-observation studies, and to communicate with students and spaceenthusiasts via Ham radio. Many of his science activities will be collaborationswith the European Space Agency (ESA) and the Hungarian Space Office. He plansto blog about the experience at his Web site, www.charlesinspace.com. "I'm honored to return to theISS and excited to conduct scientific experiments for the European SpaceAgency and for other national space organizations," Simonyi said. "Ialso hope my mission inspires young people all over the world to pursue scienceand engineering careers." Simonyi first traveled to space in April 2007 on a 13-daytrip to the ISS that made him the fifth person ever to pay for a ticket tothe orbiting laboratory. Born in Hungary, Simonyi has been a space enthusiast formost of his life, and is an avid pilot. He now heads a company he founded, theIntentional Software Corp. He said he hopes his trips to space serve to expandthe possibilities for future private space exploration. "I feel my efforts arehelping to open the space frontier to private travel," Simonyi said. "Just like all industries, it takes commitment and investment from a fewkey organizations and customers in order to open it to a larger market. Eachtime Space Adventures launches an orbital explorer, like myself, we are onestep closer to making this dream a reality for others." Images - Charles Simonyi in Space!